Answer: On the night of November 17th, through dawn on the 18th, the Leonid meteor shower will present its annual display. The Moon will be conspicuously absent from the sky most of the night, making for darker skies and better viewing. That’s the good news. The bad news is that North America will not be in the best position to enjoy the peak of activity. Still, up to 25 meteors per hour are expected. And the thing about meteor showers is, you never know what to expect since there’s too many random factors involved. On any given night, any meteor shower can be a thrill or a dud. This meteor shower is called the “Leonids” for its apparent point of origin in the sky. 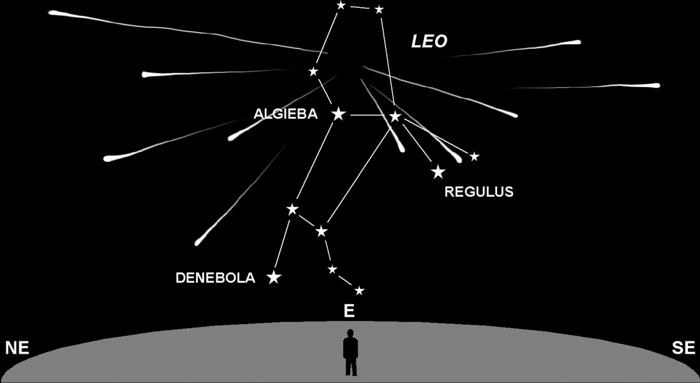 The constellation Leo (The Lion) will dominate the eastern sky from midnight to dawn, and the meteors will appear to radiate from a point near Leo’s neck. This radiant point is a matter of perspective. As Earth orbits the Sun, it regularly runs into meteor swarms of this type. When it hits the swarm, the view is much like what you’d see when driving your car through a snowstorm. All the flakes appear to be radiating from a point just ahead and down the road. Head outside after midnight, turn off all the lights, and set up a comfy chair facing east with a clear view of the sky. Then watch the the fireworks. You never know about these Leonids.